Give yourself a retirement savings plan that lets you build for the future while helping your employees take the right financial steps. We offer competitively priced, quality 401(k) plans that can also help you retain employees and improve satisfaction. 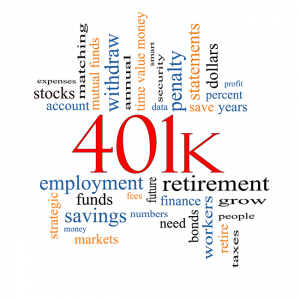 Why would I want a 401(k) plan? A 401(k) plan is a simple and affordable way to build a retirement strategy by making regular contributions to a retirement program from each paycheck. Avoid the high costs of retirement plans while still providing your employees the retirement options they deserve. Why would I use WorkGroup Payroll for my 401(k) plan? Traditional 401(k) allows employees to save for their retirement through payroll-deducted contributions while providing employers the option to make additional contributions to their employees’ 401(k) accounts. All employees, including owners, may defer up to $18,000 per year (or $24,000 per year, if age 50 or older). Regular Deferral is a pre-tax employee contribution that is deductible in the year it is made so the contribution grows tax-free. The accumulated balance will be taxed upon distribution at the individual’s then-current income tax rate. Roth Deferral is an after-tax employee contribution that is not deductible in the year it is made. Catch-Up Contributions are optional for individuals age 50 or older so they may defer up to an additional $6,000 to their 401(k) accounts, up to $24,000 annually including either Regular or Roth Deferrals. Discretionary Company Match allows you to match a percentage of each employee’s deferral, giving the freedom to offer, raise or lower the match percentage annually. Discretionary Profit Sharing lets you make one-time or periodic contributions to employees’ 401(k) plans, even if they’re not actively contributing to their own accounts. We’ll prepare estimated profit sharing calculations upon your request.Learn more and contact us at 877-222-2927 today.